Magnetic Autocontrol Winmac C Off Line Windows Facility Management System 115V with 19" touch screen color monitor, Interface Card, License for Windows 2000. Includes: PC, DUAL ETHERNET, USB&RS-232,4 PORT USB, VALIDATOR PRINTER, READER, CASH DRAWER, & MOUSE. Magnetic Autocontrol Model 1031-5052 Swing Away Flange For the Magnetic Autocontrol MIB30 Barrier Gate. Magnetic Autocontrol 1043.0138 Pendulum Support - Required for gates exceeding 14 FT. Magnetic Autocontrol BDU30-C900 110V motor For Magnetic Autocontrol MIB30 Barrier Gate Operator. Please specify if you want BDU30-R (right) or BDU30-L (left). This Magnetic Autocontrol MEC80N is an offlie exit ticket verifier with an ink jet print mechanism, 24VDC heater and thermostat and front panel LCD. The Magnetic Autocontrol MHS-8W is a 115VAC parking barrier gate operator (also known as a Magnetic Autocontrol barrier gate opener). Handles a maximum barrier gate of 33 feet. 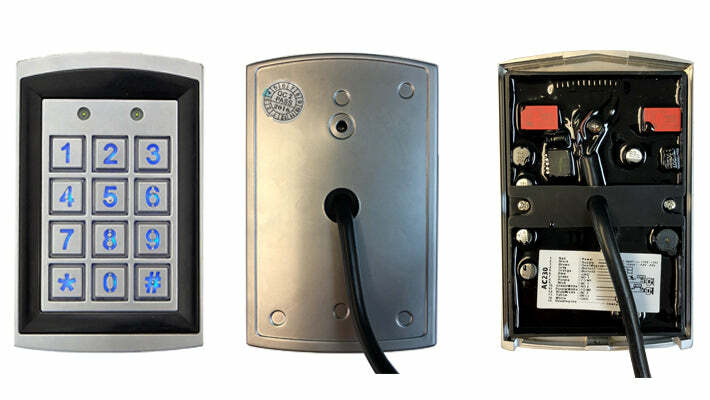 The Magnetic Autocontrol MIB-20 barrier gate operator (also known as a Magnetic Autocontrol barrier gate opener) features a special AC torque motor known for its long service life and freedom from maintenance. The operator is suitable for a wide range of installation options. The gate operator is equipped with a sophisticated braking sstem that prevents the boom from bouncing. The Magnetic Autocontrol single MPT series is a single full height turnstile with bi-directional control. Many options for configuration and color are available. Models we carry include the MPT32 (motor-driven), MPT33 (electromechanical), and MPT30 (mechanical). Magnetic Autocontrol MSB 4P 030 10' Round Aluminum Boom / Arm. Magnetic Autocontrol MSB-5B-035 12' Octagonal Swing Away Boom / Arm. Magnetic Autocontrol MSB 5K-025 articulated 8FT Arm / Boom. Magnetic Autocontrol MSB 5K-030 articulated 10FT arm / boom. Magnetic Autocontrol MSB 5K-035 Articulated 12 FT arm / boom. 8' Aluminum Barrier Arm Octagonal Shaped For Magnetic Automation's MIB20 (and some other models including the MIB30). MSB5N025. Magnetic Autocontrol MSB-5N-030 10' Aluminum Octagonal Boom / Arm. Magnetic Autocontrol MSB-5N-060 20' Aluminum Octagonal Boom / Arm. Magnetic Autocontrol MSB-6N-060 20' Aluminum Octagonal Boom / Arm. Magnetic Autocontrol MSB-6N-080 27' Aluminum Octagonal Boom / Arm. Magnetic Autocontrol MSB-6N-100 33' Aluminum Octagonal Boom / Arm. Magnetic Autocontrol MSB-9N-030 10' Foam Covered Boom / Arm. An electronic car counting device that performs counting of vehicles or counting of free places. This car counter device needs to be connected to a loop detector on the ground, photocell or any other device that will send a pulse to it. For heavily frequented facilities or if more functions are required, the high-quality Magnetic Access Pro barrier is the perfect solution. The pro selects the Magnetic Access Pro barrier because of its wide range of functions and higher operating speeds. With its barrier width of up to 6.0 m and the option for a boomskirt with climb-over prevention up to a height of 1.8 m, the Access Pro-H is the ideal solution for all entrances that require effective prevention of unauthorized pedestrian access in addition to controlled vehicle access. The control system of the Access Pro-H offers a wide range of functions and numerous expansion potentials through the use of plug-in modules. There are five slots for, e.g. an Ethernet interface, a radio module or a counting module for determining the number of parking spaces still available. All inputs and outputs can be individually configured by the user. Users can choose from numerous input and output functions. The opening and closing times can each be selected from three levels independently of one another. With its barrier width of up to 8.5 m and the optional security grating or security grating with climb-over prevention, the Access XL2 is the ideal solution for extra-wide or multi-lane entrances to freight forwarders, company grounds and port facilities. The control system of the Access XL2 offers a wide range of functions and numerous expansion potentials through the use of plug-in modules. There are five slots for, e.g. an Ethernet interface, a radio module or a counting module for determining the number of parking spaces still available. All inputs and outputs can be individually configured by the user. Users can choose from numerous input and output functions. The opening and closing times can each be selected from three levels independently of one another. With its barrier width of up to 10 m and the optional security grating or security grating with climb-over prevention, the Access XXL is the ideal solution for extra-wide or multi-lane entrances to freight forwarders, company grounds and port facilities. The control system of the Access XXL offers a wide range of functions and numerous expansion potentials through the use of plug-in modules. There are five slots for, e.g. an Ethernet interface, a radio module or a counting module for determining the number of parking spaces still available. All inputs and outputs can be individually configured by the user. Users can choose from numerous input and output functions. The opening and closing times can each be selected from three levels independently of one another. Magnetic Automation parking pro barriers are a complete barrier solution for parking systems. The design is complemented by high functionality that is well suited for high throughput revenue systems, with an opening time of 1.3 seconds and a max opening width of 12 feet. The Parking Pro barrier is offered in four color options, white, orange, light grey, and dark grey. All Parking Pro barriers contain the MGC PRO control unit with programmable I/O, selectable auto-open on power failure, multiple open/close speeds, an integrated 2-channel detector module, and a VarioBoom barrier arm with a protective foam edge. For heavily frequented parking facilities or if more functions are required, the high-quality Magnetic.Parking Pro barrier is the perfect solution. For heavily frequented parking facilities or if more functions are required, the high-quality Magnetic. Parking Pro barrier is the perfect solution. Magnetic. Parking Pro serves the professional operation and satisfies both the system supplier and the facility operator. The Magnetic Autocontrol MTS-6-920 is a barrier gate operator (also known as a Magnetic Autocontrol barrier gate opener) for a boom length of 26 feet (max). Open and closes in 6.5 seconds. Not UL approved. The Magnetic Autocontrol MTS-8-920 is a barrier gate operator (also known as a Magnetic Autocontrol barrier gate opener) for a boom length of 33 feet (max). Open and closes in 8.5 seconds. UL approved. Magnetic Autocontrol MIB-10 Toll Road Barrier Gate Operator (also known as a Magnetic Autocontrol barrier gate opener)115V / 60Hz / 120watts. ADJUSTABLE OPENING OR CLOSING TIME 0.6 TO 3.0 SEC. Maximum boom lenght 8 FT. Magnetic Autocontrol MIB40 Traffic barrier gate operator (also known as a Magnetic Autocontrol barrier gate opener) 115V, 60Hz, 120 Watts. OPENING OR CLOSING TIME 4 SECONDS. Maximum boom length 20 FT. / Maximum boom length for automatic open on power failure is 15 FT.